Powercleats® are FHA and VA Approved. The unique tip design aids in driving the cleat into flooring and underlayment. The design and single impact point helps eliminate split tongues in flooring. 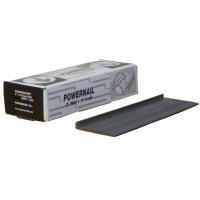 Powercleats® nails ensure trouble-free operation and optimum construction results. 16 gage nails are for use on 12mm, 15mm, 20mm. 16G-L-38 38MM 1,000 Nails per Box. 16G-L-45 45MM 1,000 Nails per Box. 16G-L-50 50MM 1,000 Nails per Box.